I met the wife of the new and fresh MK Rabbi Dov Lipman randomly last Tuesday in one of the corridors of the Knesset, accompanied by her son and her daughters. They made an impression of an ultra-Orthodox family in every respect. Somehow a conversation developed, and I quickly realized that this is the family of the excited MK, who is to be sworn in this evening. An interesting conversation developed between us, which was later joined by the MK himself. He is the only Orthodox MK in Yair Lapid's party, and is well aware of the weight of responsibility laid at his door. Even if we differ his views, concerning recruitment issues or core curriculum, there is no doubt the MK has any intention to harass or harm the haredi public. On the contrary, to his understanding he operates for the public's interest. Will he be able to influence the boss of the movement, Lapid Junior? Time will tell. However his wife and children are prepared to allow him to devote all his time in the next term for activities for the public and in general. Also his excited mother wishes him, opposite our camera, her blessing. His daughter, Devora, studies at a 'National Orthodox school' as defined by her mother. When I ask her how it feels when your father is a MK, she says in an excited voice "my classmates wished my Mazel Tov." Also her mother, Dina, seems that she still cannot get over the fact that overnight she became the wife of a MK. Did you think about it before, that your husband will be a MK? - I ask, and she smiles. "No," she certainly did not think about it. And, they are prepared for the coming period in which there will be slightly more activity in the Knesset, "to do good things for the people of Israel," she says. The son is presented by MK Lipman as "learning at yeshiva, mesechta after mesechta." So he will be one of those who studies for life? - I ask, and he prefers to leave it to the decision of his son, when the time comes. 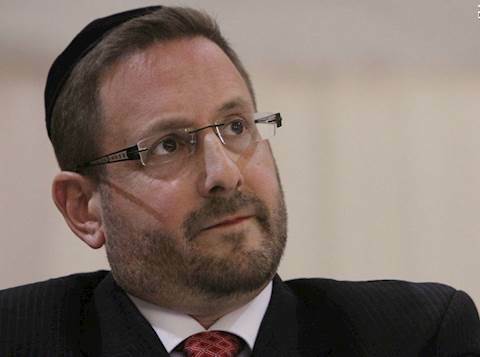 "I see myself as a representative to help the Haredim," announces MK Rabbi Lipman himself. "They should study Torah, along with work," he says, and stands by the American view he brought with him to Israel. Lipman was born in Silver Spring, Maryland, United States, where he attended a Jewish school and then went to Israel and studied at the Yeshivat Merkaz Hatorah in Jerusalem. On the one hand, he was ordained at Yeshivat Ner Yisrael in Baltimore; on the other hand, he has a master's degree in education from Johns Hopkins University. This route which is perfectly normal abroad, he seeks to bring to the Charedi community in Israel. "I went to yeshivas in the U.S., I am an ordained rabbi, I learned a lot of masechets, and I also went to university. It is not only possible, it is ideal. We also need Torah learners and we'll keep them." With numbers? With quotas? - I ask. And no, he will not get into it. For him, there will be tests, and not many will be able to pass these tests. Thousands enter the Beit Midrash, only one goes out for teaching, only the best will study all day and night. And it will happen by force? - I'm trying to find out. "Not by force," he says, but yes, he wants to enact this law. This will not happen in one day, but gradually. In any case, he protests, "They say we favor not learning Torah, which is not true." I ask him if he is already familiar with his faction associates. He smiles and says definitely yes, and tells of the formation Yair held at his home. He also recalled how at the end of the party they sang together "Adon Olam."